sweet melody and memories remain sweet, indeed! love the thoughts! and the image as well! In an easy and wonderful rhythm you are singing a beautiful verse. A rose in musical paper is a perfumed song, a song that puts a balm to the aches of love, and at the same time it puts soft melodies in the heart making it to beat in affection again! I really think your poem is wonderful! Much thanks for your wonderful comments. You uplift my spirit with all the encouraging words. You never fail to do so and that boosts me to keep on writing though along the journey I stumble and fall. But with people like you around, I'll get up again! My pleasure to share this little contribution. When you really think it's wonderful, I can't help feeling wonderful, too! I couldn't agree more. Music plays a vital role in setting our moods from bad to good. Some have the soothing effect which is good to de-stress us after a hard day's work. 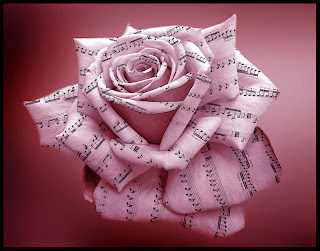 Sweet melodies are there to remind us that life can be good too, that tomorrow can be better. Music can calm our twisted & worried moods.